"We're making history - again." Isaac Chavez (Zac) just turned eighteen, maybe. He was born on February 29th of the year 2058, a leap day in a non-leap year. How did this happen, how is he here and where does he belong? Searching for answers, a sense of purpose and a place to fit in, he joins History Corp. Each Weekend, the History Corporation sponsors a MMOEHS (Massive Multi-participant Off Earth Historical Simulation) for the brightest young men and women from around the globe. Tach-Tech Museum, a space station tethered to the earth and accessible only via space elevators, provides the platform for the Historical Simulation. When a routine Simulation ends in disaster, Zac finds himself alone, his friends lost somewhere in time! Searching the “Inter-web”, Zac discovers clues that he hopes will lead him not only to his friends but to answers about his origins. Using a combination of old and new technologies he’ll journey through the annals of time, into history’s great unknown, hoping to save his friends and find himself. Timekeepers - The End of the Beginning has not been tagged yet. Help others find Timekeepers - The End of the Beginning by tagging it! 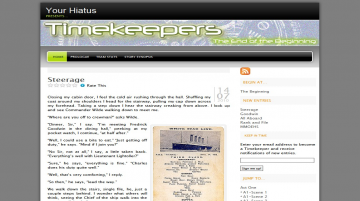 Timekeepers - The End of the Beginning has not been reviewed yet. Timekeepers - The End of the Beginning has not been recommended yet.